With West Nile On The Rise, We Answer Your Questions : Shots - Health News Every state except Alaska and Hawaii has reported West Nile virus in people, birds or mosquitoes. The Centers for Disease Control and Prevention expects human cases will rise through October. In Texas, the worst-hit state, deaths reached 31. 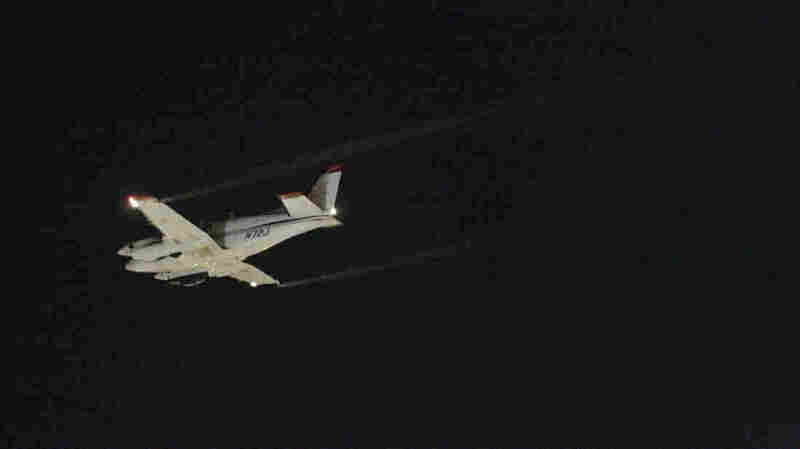 A Beechcraft airplane sprays insecticide over Dallas early Monday morning to curb the spread of West Nile virus. 1,590 reported cases, nearly 500 more than a week ago for a rise of 44 percent. 889 cases, or 56 percent, involve severe neurological disease. 66 deaths, compared to 41 last week. Every state except Alaska and Hawaii has reported West Nile virus in people, birds or mosquitoes. "We expect the number of cases will rise through October," says Dr. Lyle Petersen, director of the CDC's division of vector-borne infections. In Texas, the worst-hit state, cases jumped by nearly 200 over the past week and deaths reached 31, up 10 from last week. "As I look at the data, I'm not convinced we have peaked," Texas health commissioner Dr, David Lakey told reporters on a CDC conference call Wednesday. As the reported numbers have mounted, many NPR listeners emailed us with questions about West Nile. We put them to to Dr. Erin Staples, a medical epidemiologist in CDC's arbovirus diseases branch, and Dr. Robert Haley of the University of Texas Southwestern Medical Center in Dallas. Haley wrote a commentary on the situation in the current JAMA, the Journal of the American Medical Association. Here's a selection of the most frequently asked questions and answers from them and other sources. Q: Where did West Nile virus come from? And how did it get into the United States? A: It was discovered in the West Nile District of Uganda in 1937, and later found in Africa, Asia, the Middle East and Europe. The West Nile virus now found across the continental United States, Canada, Central America and the Caribbean is an Israeli strain introduced into New York City in 1999. It was likely carried by an infected stowaway mosquito that arrived by plane or cargo ship. Some think an off-course bird might have carried the virus to North America, but Haley thinks this is unlikely. "Bird infections last only a few days," he says, "and the bird would have been sick and unable to fly long distances." Haley says WNV is related to mosquito-borne viruses that cause St. Louis encephalitis, dengue fever, yellow fever and Japanese encephalitis. Q: Why is West Nile disease so bad this year? Is global warming a factor? A: "That's a good and complicated question," Staples says. "It's not clear why we're seeing more West Nile Virus activity." One prominent theory is that an unusually mild winter last year allowed more WNV-infected mosquitoes to survive, giving the virus a head start when spring arrived. Then there's the unusually hot weather many areas suffered this summer. Haley says the Culex pipens mosquito, the urban-dwelling primary carrier of WNV, "breeds a little differently than others. They like a hot, dry summer punctuated by a little rainfall here and there – and a lot of stagnant water produced by humans." Haley says this summer "was just right" from Culex's point of view – especially in Dallas, which has been hardest hit by WNV of any US city. "We've had several very strategic rainfalls — large thunderstorms that swept over Dallas," Haley says. But Staples says it's too soon to attribute this year's unusual WNV activity to climate change. "Some of our largest years were 2002 and 2003, and more recent years have been low by comparison," the CDC epidemiologist says. "We see waxes and wanes, not a steady increase." Q: Health officials in Texas and other areas are ordering aerial spraying of insecticides to kill mosquitoes, hoping that will quell outbreaks. But won't that kill beneficial insects such as bees and butterflies? And what's the risk for people? A: The CDC and Environmental Protection Agency say there's virtually no risk to people from aerial spraying to kill mosquitoes, and very small risk to "good" insects or the environment. The insecticides used for this purpose are pyrethrins, synthetic versions of a natural insecticide found in chrysanthemums. They have a good safety record. The insecticides excite mosquitoes and eventually paralyze the insects' breathing muscles. These insecticides are used in very low concentrations for aerial spraying — about a teaspoon for an area the size of a football field. This kind of spraying produces microscopic droplets about the size of a red blood cell. So nobody standing underneath gets more than a negligible exposure. And most of the spray, Haley says, doesn't penetrate the tree canopies where Culex mosquitoes hang out. Moreover, aerial spraying is done at night, when the mosquitoes are active but beneficial insects aren't. Pyrethrin insecticides break down quickly when exposed to sunlight and air, so there is environmental buildup isn't an issue. One problem: Too much spraying can produce insecticide-resistant mosquitoes. So public health officials generally restrict spraying to a couple of applications within a two-week period. But that's been shown to squelch WNV outbreaks. Texas health commissioner Lakey says officials there should know soon if spraying in Dallas County has eradicated WNV-infected mosquitoes. Because of a lag time in reporting human cases, it will take several weeks to know if spraying has been effective in stopping the outbreak there. Q: How serious is WNV disease? Can people suffer long-term effects? Four out of five people infected with WNV don't even know it. They have no symptoms. The rest experience an unpleasant flu-like illness marked by fever and chills, headaches, fatigue and pain in muscles and joints. Symptoms often last three to six days, but some people don't recover for weeks. About 1 in 150 people infected with the virus develop infections of the brain (encephalitis) or surrounding tissue (meningitis). Those can cause severe headache, fever, stiff neck, confusion, convulsions, coma, tremors, muscle weakness and paralysis. Around 10 percent of people with WNV encephalitis die. Many with neurologic involvement require weeks of hospitalization and some are left with permanent effects, such as muscle weakness and paralysis. In July Dr. Kristy Murray and her colleagues at Baylor College of Medicine in Houston published a report on 139 people who had recovered from WNV infection. Forty percent had chronic kidney disease. While some of these had kidney problems before their WNV infection, the Houston researchers think many developed kidney disease as a result of the virus. Staples says the CDC is aware of the Houston report, but it's too small a study to determine if WNV causes long-term kidney disease. "It's definitely something that needs further study," she says. Curiously, WNV disease was largely a milder disease before it arrived in North America 13 years ago. Staples says no one knows why so-called "neuroinvasive" disease is more common these days. Petersen of the CDC says there's no evidence so far that neuroinvasive disease has become more common since 1999. Q: Is West Nile Virus a threat to my pet or livestock? A: Among mammals, humans and horses are the only ones known to die of WNV infection – almost always from the neurologic form of the disease. Staples says experiments with dogs showed they developed no symptoms at all, and cats had only mild symptoms. There is no evidence of animal-to-person transmission or animal-to-animal infection. The mosquito is always the bridge. Dr. John Glisson of the U.S. Poultry and Egg Association says all birds are susceptible to WNV to some degree, but many species don't get sick from it. "Chickens can become infected but show no ill effects," he says. "It has never been a problem for the poultry industry." Among wild birds, the corvids — especially crows and blue jays — are most likely to die from WNV. But Haley says robins are most important in amplifying the amount of virus in the environment because they have several broods in a season, and baby robins are especially vulnerable to the bites of infected mosquitoes. Q: If I get infected with WNV, will I be immune from future infections? A: Yes. Doctors think infection produces lifelong immunity. The CDC estimates about 3 million Americans have been infected with WNV, though most of them don't know it. Q: Can I get tested to see if I'm immune? A: There is a test, called an ELISA, for WNV antibodies. But the CDC doesn't encourage people to get it unless a doctor recommends it for a particular medical reason. The test can be prone to false positives. "It's best to assume that you're not immune unless you know you've had WNV," Staples says. The best way to protect yourself is to avoid mosquito bites. That means using insect repellant, wearing long sleeves and pants when outside at dawn or dusk when mosquitoes are most likely to bite, and keeping window screens in good repair. The agency also stresses emptying any standing pools of water — from bird baths, wading pools, tire swings or any other source — to foil mosquito breeding. Q: Since people become immune after infection, why isn't there a vaccine for WNV? A: There is a vaccine – actually four different marketed vaccines – for horses. And there has been some research on a human WNV vaccine, including some successful early trials in humans. But the effort to develop a human vaccine has hit a wall. "We're not currently aware of any ongoing studies to move a human WNV vaccine towards licensure," Staples says. One big problem is how to test a candidate vaccine in large-enough numbers of human volunteers — some of whom would get the real vaccine and others a placebo. "To do that we'd have to be able to predict where WNV will occur," Staples says. And if a human vaccine were developed, it's not clear how it would be deployed. A 2006 CDC study concluded universal vaccination against WNV wouldn't be cost-effective. It's conceivable that a vaccine would be targeted to older individuals and those with particular risks from WNV infection, such as those with kidney disease or compromised immune systems. But that market might not be large enough to justify the costs of development. The calculus could change, however, if WNV outbreaks continue to increase.